By all accounts, comedian Marc Maron has hit a new career peak since what he felt was his lowest point about four years ago now. Having interviewed Maron in 2009, we were pleased to catch up with him in the wake of his success. Even with his preternatural, ingrained self-doubt, Maron may actually be satisfied with the reception for his new book “Attempting Normal ” and his TV series on IFC (also available for purchase through Amazon and iTunes), “Maron.” That’s what he tells us in this interview about those projects, and on page two, about doing the “WTF” podcast whose popularity made those works possible. Maron will be in New York for two events promoting the book this coming week – June 12 at Barnes & Noble in Union Square, and June 13 in Bryant Park (see calendar). Jester: Are you satisfied with what’s been happening with the book being published, the show and all the big projects? 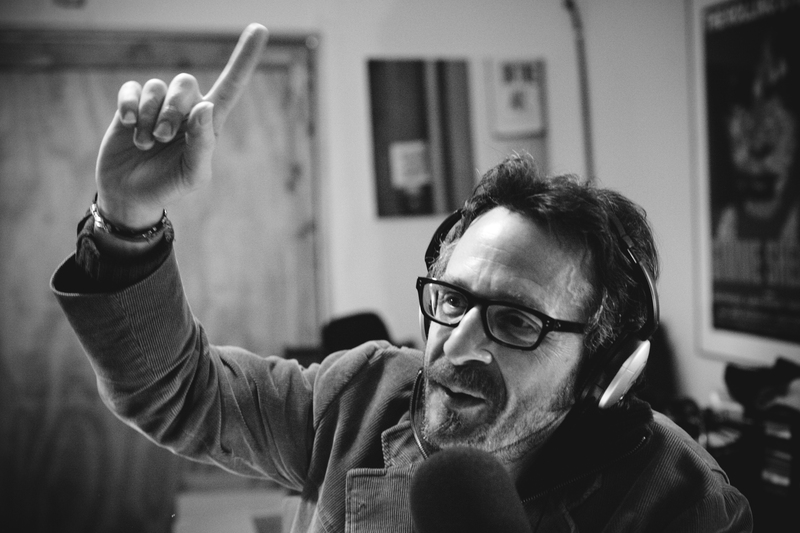 Marc Maron: Everything’s great. Everything seems to be moving along. People are enjoying the show. They seem to be buying the book. I can’t complain really. J: You’re not looking at the other bestsellers that are further up the list, or having those kinds of reactions? MM: I’m not. I don’t know why I’m not, but I’m not doing that. I hoped it would – it made the bestseller list briefly, the extended list, in its first week, and was number 24. I would have liked it to have been higher, but what are you gonna do? All the feedback I’m getting is positive. In terms of how it sells, that’s not really my problem after a certain point. J: How did you approach this compared to when you wrote “Jerusalem Syndrome”? MM: “Jerusalem Syndrome” was a single narrative based on a one-person show, and I just focused day in and day out on expanding that story. This was more piecemeal in that I was doing short pieces, and a lot of them were expanding ideas I had before or had talked about before, but also some newer stuff about my family. So it was a little more fragmented, but in that way, a little easier to focus and write when I sat down write because they were short pieces. There was an immediate end in sight. But it was a very stressful thing. The process was different in that when I finished a piece, it was finished. That was part of the book. But with “Jerusalem Syndrome,” all I could think about was finishing the book. J: Would you say it was easier or harder than that book? MM: It’s hard writing a book no matter what. It’s very time consuming and stressful. There’s a lot of fear involved in it, stirred up for me, because I don’t call myself a writer. I’m a comedian and I do a podcast, but I have friends who are real writers, and I’m wary of calling myself a writer. Sometimes I’m a little insecure about writing, but what I do is lock in and focus. I definitely have a tone and way of engaging with the page. So I’m happy about it. I think it’s a good book. J: With the TV show, do you think you accomplished what you were setting out to do? MM: Yea – the tone of the show is uniquely mine. I did the best I could with the time, money and staff that we had, and I think it turned out very well. I had never done a lot of that stuff. I never acted on television really, to any degree. I never wrote television or produced television. I had never worked with a production like that. So it was all a new experience. The tone is unique, it’s funny, it’s touching. I think it came out really well. No matter what anybody says about it, they can’t say it’s really like anything else or feels like anything else. If we do more shows it would be exciting to see what worked and really sit down with those 10, talk about it, figure out where we go and how we engage the character more. I went in just acting like myself, and dealing with the scripts we got. I’d like to keep doing it and try to do some more, and make them better. You want to keep working, that’s all. J: Do you have something like another 10 outlines in your head if you do a second season? MM: Sure. I don’t think the stories would be difficult. It would just be focusing on what was successful about it, about these, now that people have seen them and we’ve sat with them awhile. Which ones resonated, and why – and focus on deepening the characters, and deepening my character. Take more chances with the writing, both comedically and emotionally. Page 2: Maron talks about "WTF"